Discussions in several fora - from regional workshops to international seminars on SDGs - have underlined the great urgency to establish national data portals/platforms for the reporting of the SDG indicators in both developing and developed countries. The urgency to discuss this issue derives from the fact that in many developing countries existing data reporting platforms are either not fully functional or not fully suitable for the reporting of SDG indicators or have only a limited functionality. Moreover, so far, no arrangements and products have emerged that would establish common sustainable solutions for a large number of countries, as it was the case with DevInfo, which was used in about 120 countries during the MDGs. A study on national data portals published in 2016 by PARIS21 concluded that while there have been many well-intentioned efforts to make these portals available to countries, the outcomes are rather mixed particularly in the most aid-dependent countries. The frequent establishment of multiple parallel platforms has often resulted in (i) a duplication of workload for already resource-constrained NSOs, which have to maintain several portals and update information manually, (ii) confusion for users, who consult the various portals with often conflicting results, and (iii) overall high costs for demonstrably low usage of these portals. The Cape Town Global Action Plan for Sustainable Development Data acknowledges the urgent need for National statistical systems (NSS) to adapt and develop to meet the widening, increasing and evolving requirements of data to monitor the progress towards goals and targets of the 2030 Agenda for Sustainable Development as well as provide adequate data for data users, especially decision-makers. The UN Development Account 10th tranche programme on Statistics and Data (UNDA10) addresses these challenges and brings together the collective efforts of ten implementing entities into a comprehensive programme aiming at strengthening national statistical systems to measure, monitor and report on the sustainable development goals. The United Nations Statistics Division (UNSD) and the Statistical Centre for the Cooperation Council for the Arab Countries of the Gulf (GCC-Stat) are jointly organizing a Regional Workshop on International Merchandise Trade Statistics in Muscat, Oman from 7 to 10 February, 2016. The objective of the workshop is to improve the understanding of international recommendations on international merchandise trade statistics and to share hands-on experiences in data acquisition, data compilation strategies (including data standardization and checking), data quality framework and data analysis and dissemination among trade statistics compilers. The main objectives of the meeting are to: review the mandate and working mechanisms of the group; discuss strategic aspects of the implementation of a global Sustainable Development Goal (SDG) Indicator framework, and discuss next steps in the HLG programme of work for 2016, including the organization of the World Forum on Sustainable Development Data. 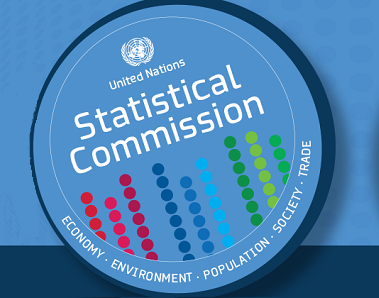 The United Nations Statistics Division and the Statistical Office of the European Communities are organizing the Global Conference on a Transformative Agenda for Official Statistics. The conference seeks to formulate an adequate response to the increased demand for detailed and timely data to monitor progress on the goals and targets of the post-2015 development agenda. These goals and targets are universal in the sense that they concern all United Nations Member States, but they are specific at the same time in the way they are formulated at sub-national, national and regional levels. These new demands require a more efficiently functioning national statistical system. This Conference is organized as a High-Level Forum of official statisticians with the purpose to seek a broad consensus on the strategic agenda for statistics for the consideration of the 46th Session of the Statistical Commission in March 2015. This Seminar will present UNSD's vision for advancing the Global Statistical System and establishing statistical and spatial infrastructures as supporting components. The System currently operates well within a normative framework with established professional ethics and methodological guidelines, and has embarked on projects of global scale. However, it is conservative in nature, and has yet to focus its attention (and its resources) on emerging development issues. The seminar hopes to explore ways in which the Global Statistical System could respond more effectively to the measurement requirements of urgent development issues. This workshop is organized within the framework of the project on Strengthening Statistical Capacity in support of progress towards the internationally agreed development goals in the Southern African Development Community region (SADC). The purpose of this workshop is to provide a forum for active sharing of experience and training in the areas of Leadership and Management, Staffing, Statistical Legislation and Positioning of National Statistical Offices in Government, as agreed during the discussions at the first steering committee meeting of the abovementioned project. The Final Steering Committee Meeting and Workshop on Strategic Planning of Statistical Activities is organised in line with the project on Strengthening Statistical Capacity-Building in Support of the Millennium Development Goals in the region of the Economic Community of West African States (ECOWAS). The main purpose of the steering committee meeting, which will be the last under this project, is to review the project’s final products and, in collaboration with UNSD, ECOWAS Secretariat and UNECA, to chart a way to institutionalize the activities started under the project. This will ensure that there is continuity in the advancement of statistics in the ECOWAS region after the project phases out at the end of 2006. The workshop will focus on practical approaches managers can use to balance day to day responsibilities with long term objectives; and practical ways on how a major statistical project can be used to further the long term goals of the national statistical system as a whole. The workshop will be attended by more than 40 participants from 16 African countries, the ECOWAS Secretariat and UNECA. The meeting, organized by DESA/Statistics Division and hosted by Statistics South Africa, will launch the new project on Strengthening Statistical Capacity in support of progress towards the internationally agreed development goals in the Southern African Development Community region (SADC). The meeting will bring together the Steering Committee, consisting of the heads of SADC national statistical offices, SADC Secretariat, UNECA and UNSD and all other development partners with current or planned activities in the region. The meeting will discuss and assess needs and priorities for statistical capacity building in the SADC region, review the proposal by the various partners and review and agree on the overall implementation plan for the project as developed and proposed by UNSD.